If one is traveling by airplane on both ends of a TD attempt, more often than not it can be cheapest to book 1 multi-city ticket. Sometimes called 'open-jaw' by reservations agents. Request into YYC (calgary) and out of PHX (phoenix), TUS (tucson), ELP (el paso) or ABQ (albuquerque). The drawback is one must choose a return date well in advance of a start date, whereas a 1-way (14-day advance) return ticket can be purchased as late as day 4 or 5 an attempt. Bike transport: We strongly recommend anyone arriving to Calgary on an international flight fly WITH their bike. Shipping a bike ahead is not recommended. Historically the Canadian customs' time-to-release for bike shipments can be as much as a week (or more if paperwork is not in order). Banff Airporter Shuttle Svc. *TD Official Shuttle Svc. 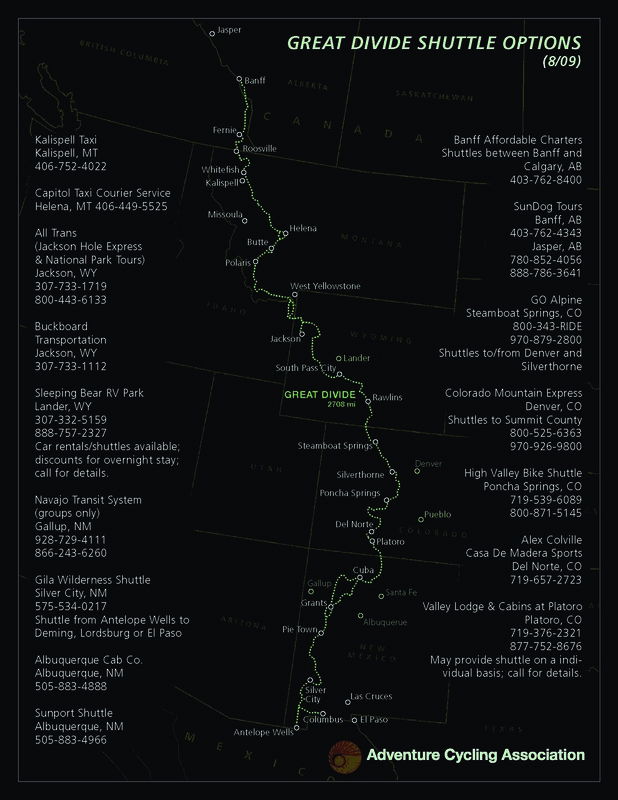 For comprehensive listings of all lodging resources along the route refer to the Services section on each of the seven ACA GDMBR section maps. For selecting out only the poshest, high cotton accommodations along the way you can go to this list of B&B's but do verify their currency with the ACA list (updated annually).